I'm here to tell you that you should be sharpening your own knives, or at least, you can sharpen your own knives, because it's surprisingly easy. For years I've been relying on the occasional visit of a mobile knife sharpener, but a recent experience left me thinking maybe this wasn't the best approach (The blade on my favorite knife came back with small teeth along the edge, possibly from being ground down a bit too hard). I'd used the cheap hand held knife sharpeners before, but never got great results, or really any results, especially with really dull knives. So I started watching knife sharpening videos on YouTube. Lots of knife sharpening videos! And I also read a bunch of blog posts (this one was super helpful), and as is the result with pretty much all good internet research, I came to the conclusion that yes, I can do this and I should do this myself. So I ordered up a whetstone set from Garrett Wade and went to it. (Update: Our friends at Huckberrt just started carrying this whetstone set that's well worth checking out too). 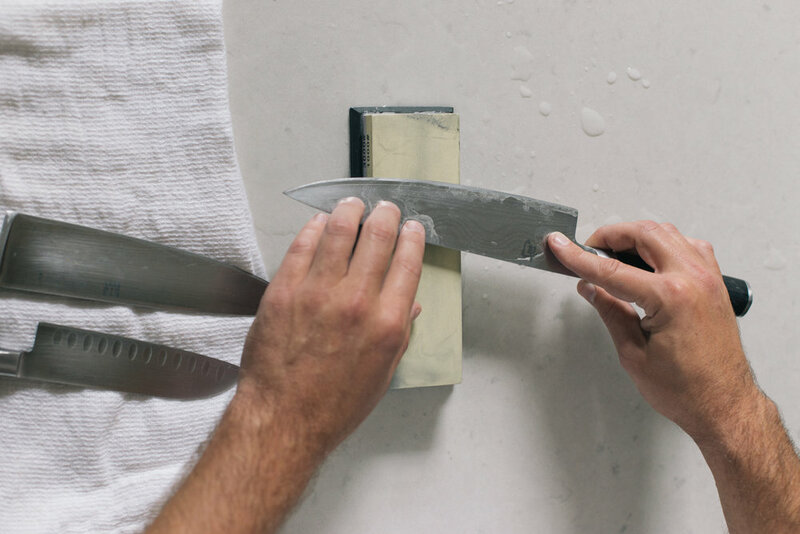 The most jarring part of sharpening a knife for the first time is the counterintuitive motion of running the blade against the stone, as in pushing it against the stone instead of pulling it. This is just one of the conflicting techniques you'll come across depending on the site, YouTube channel, or person you ask for advice. Some will say to do it, some will say don't. You'll see a bunch of different approaches. Place the whetstone parallel to the body. Place it perpendicular. Use two hands. Use one hand. Sharpen at 15 degree angle. Sharpen at a 30 degree angle. There are endless approaches and it's a bit confusing. But actually sharpening a knife is not, and you can try all these approaches, really, without doing any permanent damage to your knives. Even with some basic internet research and a simple whetstone set, I was able to make my knives remarkably sharper on the first go. I didn't do an expert job, but I didn't damage them either. Now, I'm at the point now where I'm learning specifics like stropping, burr formation and mastering hardest part, creating a consistent sharpness the length of the blade. Needless to say this gets harder with bigger knives and curved blades. It involves sort of rolling the wrist slightly when sharpening. Hard, but not impossible. And that's what sharpening a knife on a whetstone work comes down to. There's a little bit of a learning curve—technique to learn— but it's not impossible at all. I geek out on small projects I can do in my apartment. I also like taking care of my tools and my toys. It’s why I like doing ding repair on my surfboard and doing my own bike maintenance too. I'm far from an expert, but I enjoy the process of learning. And, I like sharp blades on my knives.